Hi Everyone, Kristina here! Wedding season is upon us isn’t it? 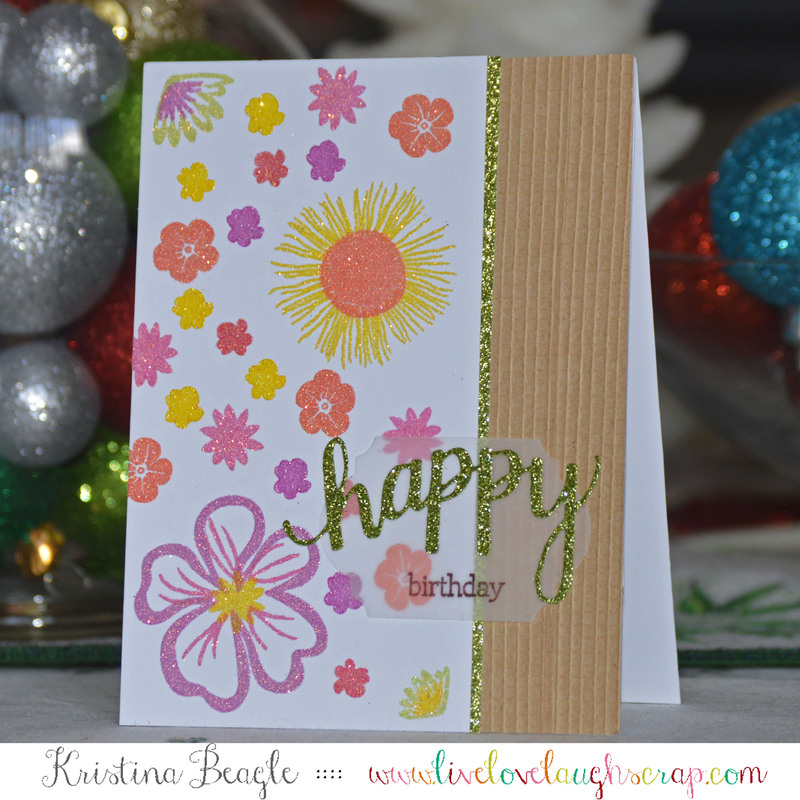 I’ve got a card to share with you today using the new Sugartree Stamps “Mr. & Mrs.” wedding themed digital stamp set. I just love the getaway car image. Teal is one of my favorite wedding colors so after printing out my image I used copic markers to color her in before moving on to the rest of the card. I cut out some vine and floral images from Spellbinders, adhered to stick it adhesive so I could glitter. I glittered the die cuts with Elizabeth Craft Silk Microfine Glitter. To finish I mounted the card panel onto some Hero Arts layering paper in pool, and added Nuvo Drop accents. Sugartree Stamps Mr. & Mrs. Categories: Handmade Cards, Sugartree Stamps, Wedding & Anniversary | Tags: glitter, Kristina, Teal, Wedding Card | Permalink. I am back to share another glittery card. I use some glitter tapes and gold EP to achieve some sparkles!! So what do you think? Here’s a close up. Adhere gold and silver glitter tape horizontally onto a Hero Arts Charcoal Folded Card alternating each colour leaving 1/4 inch in between each. Set aside. Stamp and heat emboss with gold EP two flowers and four leaf branches from the Hero Arts Stamp Your Own Succulent set on pink and green card stocks. Trim closely. Ink center of flowers with red distress ink such as Barn Door. On white card stock stamp the book shape from the Hero Arts I Love Books set and sentiment from the Hero Art Many Birthday Messages with black ink and heat emboss with clear powder as shown. Trim book shape closely. Adhere book shape, flowers and leaves with foam adhesive as shown. I think the Charcoal card gives a good strong background for the glitter tapes and the embossed images. A2z carries many Hero Arts Layering Paper and Folded Cards. They come in many pretty colours too! Go take a look at the store Here. Feel free to use promote code Cindy15 at check out to obtain 15% off any purchase of $25 or more (shipping not included) when you go shopping. Please note that a2z is also on Twitter, Instagram and Facebook. Follow us on these social media outlet if you have not already done so. You don’t want to miss out on any future promotion! Categories: Embossing | Tags: birthday cards, glitter | Permalink. Hi there. Dawn back with some more glittery goodness. A big thank you to Arlene who sent me this beauty. It’s the Hero Arts Butterfly Fancy Dies DI078 I liked it so much I ordered it… so should you. Just follow the link above to A2Z Scrapbooking. I added a sentiment from Hero Arts Layering Happy Days Flowers CL864 Of course, I added some different coloured gems to draw in the colours from the background. That was made by using paints, Zig markers and Lindy’s Gang sprays. Remember if you are in need of any items from the a2z Scrapbooking store you can use code Dawn15 at checkout to receive 15% off your purchase of $25 or more. (before tax and shipping) And don’t forget that we are on Twitter, Instagram and Facebook. Follow us on these different social media outlets so you won’t miss out on any fun promotions. Categories: Birthday, Watercolor | Tags: Butterly, die cutting, diecuts, glitter, Hero Arts, stamping | Permalink. As you know this month challenge is Fireworks: Lots of Glitter & Bling. I stamped all of my images in pigment ink and heat embossed with Ranger Sticky Embossing powder, which when heated, becomes nice and tacky, perfect to adhere glitter! You can do one of two things to get great glittered images. 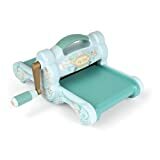 Stamp in your favorite colored pigment inks then emboss with the sticky embossing powder and apply a translucent glitter -OR- stamp in VersaMark, emboss with the sticky, and then glitter in your favorite colored glitter. This card uses pigment ink with ultrafine translucent glitter. 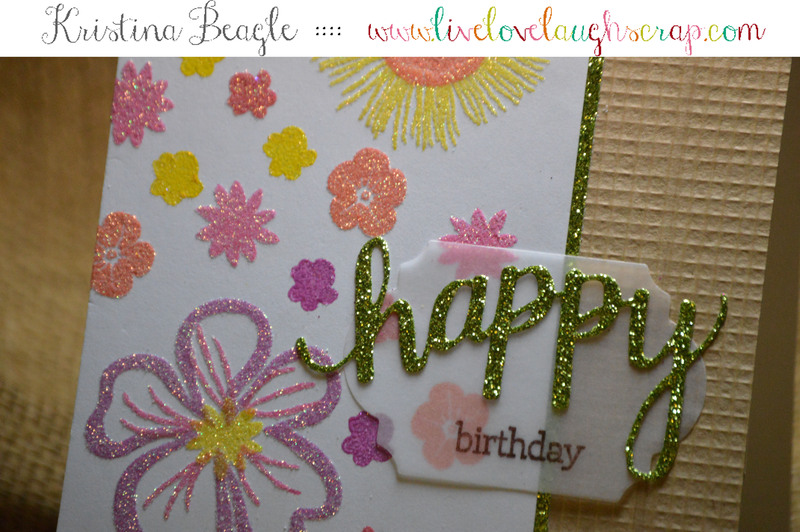 Categories: Birthday, Handmade Cards | Tags: Bling, glitter, Kristina | Permalink. Hope you enjoying the New Year!! Now that the holiday rush is over, I want to make some non Christmas theme cards! This month’s challenge is Fireworks (Add some glitter and bling)! Will you join in? Die cut Floral Heart on purple glitter paper. On lime green card base measure out where the die cut would be, lightly mark lines for the arrow. Stamp arrow from the Hero Arts Time set with black ink as shown. Stamp sentiment above die cut with black ink. Adhere die cut with foam adhesive. Embellish with small flower sequins. I hope I’ve inspired you to join in the fun of this month’s challenge – Fireworks (Add some glitter and bling), so make it as sparkly as you’d like. Please use at least one Hero Arts stamp, die, or stencil. Floral Heart Stamp & Cut Set by Lia set is still available at the a2z store. Feel free to use promote code Cindy15 when you go shopping. Get 15% off any purchase of $25 or more (shipping not included), use code at check out. I have a second project to share on my blog Escape To Stamping, you could check it out here. Categories: Valentine | Tags: glitter | Permalink. Measure and cut both white cardstock and Sookwang double-stick sheet approx. 3 1/4 by 3 1/4 inch. Peel off backing of Sookwang and adhere to white cardstock, die cut ornament from Hero Arts Winter Cheer Tag by Lia with this piece. Peel off release paper from the die cut ornament, sprinkle glitter powder such as Hero Arts Prisma Glitter all over, shake off excess and burnish it. Glue small ribbon bow on top. Set aside. Repeat process using leaf die to create two glittery leave cluster. Set aside. Score and fold the front of a white card down the middle horizontally creating two planes. Measure designer paper to fit, distress edges, and glue to card. Die cut “Joy” using Hero Arts Alphabet Uppercase Fancy Die from same designer paper. Glue onto ornament using glossy accent. Add strip of gold glitter tape to inside edge of card. Score small tag in the middle, apply glue to lower half of tag, adhere to inside of card just above the glitter tape. Adhere ornament, art flower, and leaves onto lower portion of the card front as shown. You would see that there is a subtle difference in colours between the ornament and leaves even though I used the same glitter. The cause is the paper. I used white cardstock for the ornament, but off white for the leaves, I want to match the flower center which is cream coloured. I hope I’ve inspired you to join in the fun of this month’s challenge -Make it Pop, and it does not have to be a holiday card, any theme as long as it pops!! Check full detail Here. Are you tired of making holiday card already? Well how about get a head start on Valentine card, there is a wonderful selection of new Valentine theme stamps and dies in the store, check them out Here. Feel free to use promote code Cindy15 at check out to obtain 15% off any purchase of $25 or more (shipping not included). I am linking up this project to the Addicted to CAS: Challenge #78 – Joy. Categories: Christmas | Tags: easel card, glitter, holidays | Permalink.